If you haven’t already heard, Acquisio is holding its first annual User Summit this summer in Montreal. The event will be happening right in the middle of the excitement of the Montreal International Jazz Festival, and will be two days of intense learning and networking to help you maximize the performance of your accounts and grow your business. Register now to get in on the early bird rate, and save an additional 50% on the cost of your ticket. In additional to the keynotes kicking off each day, we’ve planned two tracks of sessions & workshops at the 2012 Acquisio User Summit, to be given by experts from across the industry. More details are available on the Agenda page, but the two tracks are designed to appeal to different sides of the agency coin. Of course, the knowledge and networking aren’t the only reason you should come. We’ve also planned the Summit to coincide with the Montreal International Jazz Festival. So you’ll perfect excuse to take a business trip to one of the festival that holds the 2004 Guinness World Record as the world’s largest jazz festival. And if you register before March 31, 2012, you can get 50% off with the early bird special. And it gets better. Usually, hotels are at a premium during the Jazz Fest. But Acquisio has negotiated a group rate at a hotel that is literally in the middle of the action — normal, everyday prices. We’ll be announcing the keynotes and other speakers in the weeks to come. We can’t drop any names yet, but we promise to bring together some of the best minds of the SEM and Social Media advertising industries. And there are still sponsorship opportunities open. Sponsor participation in the Acquisio Summit offers an extensive opportunities to reach agency executives, help you achieve your marketing objectives, and fit your budget. Generate leads, foster consideration and build brand awareness. 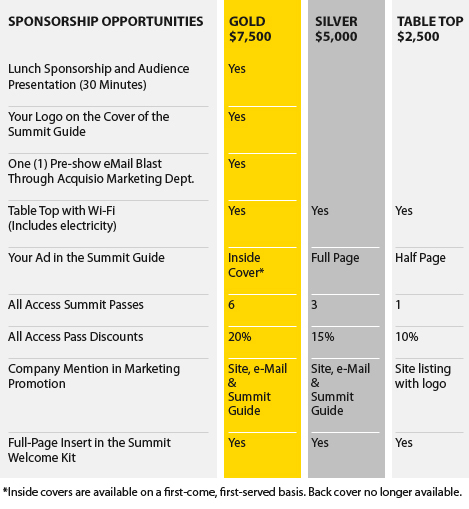 Here’s an overview of the sponsorship packages. For more information, check the sponsorship page. In addition to our Gold, Silver, and Table Top sponsorship packages, we’re also offering a variety of other opportunities for your brand to reach attendees. For more information on these other sponsorship opportunities, please fill out this form. So don’t waste any time. It’s not everyday that you get to go to Montreal during the biggest Jazz Festival in the world, stay in a hotel at non-festival rates, and rub elbows with some of the best minds in the industry.